Love looking at babies? 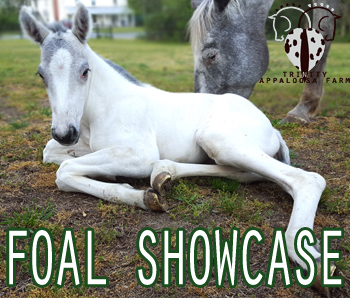 Check out our Foal Showcase and see a gallery of foals born in recent years! Welcome to the American Sugarbush Harlequin Draft Association. 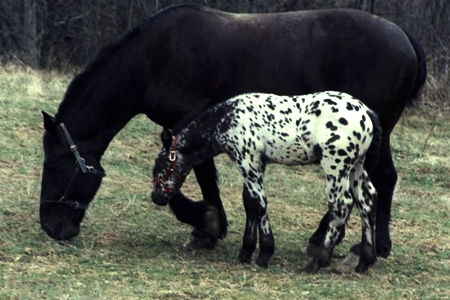 We are a group of dedicated horse lovers working to preserve the American Sugarbush Harlequin Draft for future generations. This stunning and unique breed is one that was on the verge of extinction, and through careful husbandry and research it is being brought back from the brink. A young Sugarbush Harley Quinne with dam. What is a Sugarbush Harlequin Draft? It’s a combination of all the best things you can ask for in a horse. It’s intelligent, well built, eye catching, has lovely movement, good disposition, agile and versatile. This is not a plow horse with a saddle propped on its, nor is it a light horse that cannot take the rigors of today’s modern riders. The Sugarbush Harlequin Draft is a true multi tasker. He can be ridden, driven, show, be used as a therapy horse, fox hunter, packing, basically anything any horse can do, he can do. The Sugarbush Harlequin Draft is a horse that is only limited by your imagination. What is ASHDA? It’s an association that was put together to preserve the heritage and ensure the future of this breed. It’s a family based organization that supports a membership of varied interests and levels of ability. From young to old, professional to new horse owner, we have something to offer everyone. As our breed grows, opportunities will grow with it. The American Sugarbush Harlequin Draft is a highly marketable animal that will fill a niche currently missing in the horse industry, that of a very sound, eye-catching, easily trained and genetically defect free animal. We’re committed for the long term, for our members and our horses. Copyright © 2014-2018 American Sugarbush Harlequin Draft Association/ASHDA All images and content are property of ASHDA or used with permission.